This reading passage describes how genes in the nuclear DNA and in the mitochondrial DNA (mtDNA) code for proteins found in the inner membrane of the mitochondria. Mutations in those genes can cause the protein to not work, resulting in cells not getting enough energy. This article has specific details about the five protein complexes found in the inner membrane, but students do not need to understand cellular respiration at this point. In fact, this is a good bridge between the cell chapter and the chapter on cellular respiration. It can also be used to introduce the “one gene, one protein” hypothesis. The reading was designed for AP Biology students but it can work for other levels with some guidance. 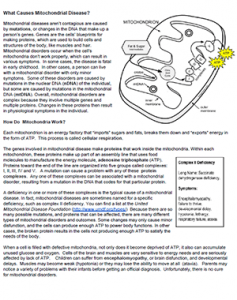 Mitochondrial disease is introduced in freshman biology, but students are not given very many details. The worksheet asks students to define basic terms related to the passage, identify the CLAIM being made and provide evidence, or details, that support the claim. 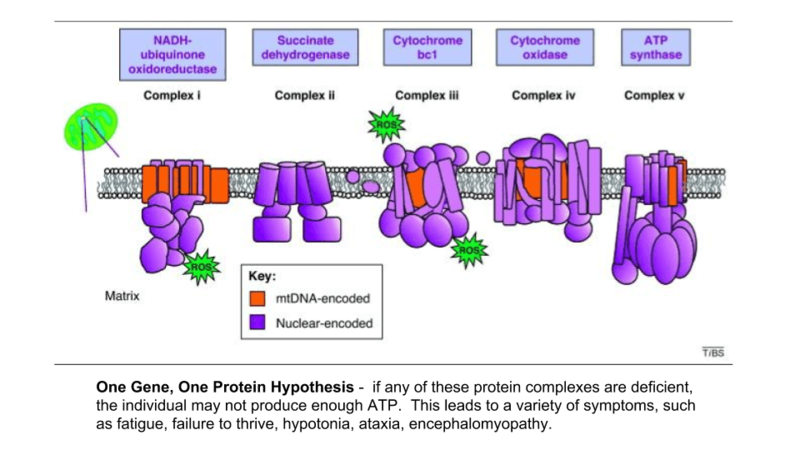 The lecture slides also include an image of the 5 protein complexes color-coded to show which part of the protein is coded by nDNA and which is coded by mtDNA. The goal is to introduce students to cellular respiration and gene theory. Discussion can follow about why it will be difficult to cure mitochondrial disease.